For somebody who loves feeding others, I seem to have a propensity for surrounding myself with people with serious food issues. The omnipresence of my famously flavourphobic partner aside, my small circle of family and friends seem to be a motley crew made up of those with various intolerances, medically restricted diets, committed (and occasional) vegetarians, coriander-loathers, banana-haters and even someone who can’t eat anything green. Whilst I love feeding each and every one of them, they do, however, present somewhat of a challenge to cook for. Luckily (for them? ), I do love a good challenge and catering for their specific needs and preferences does force me to try out new things. More often than not, the end results become firm personal favourites. 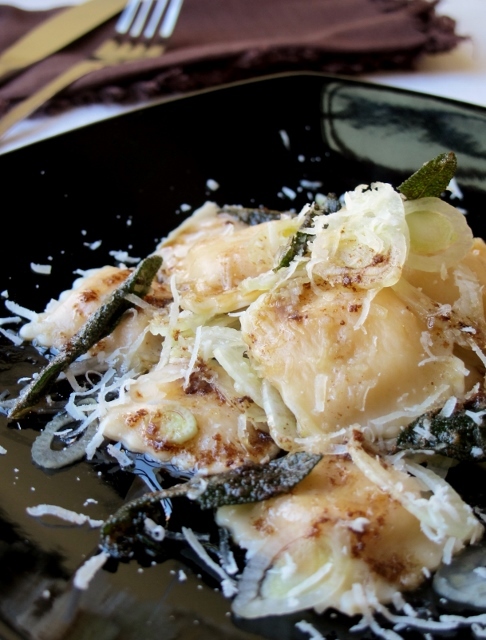 Which brings me to this particular recipe: Pumpkin Ravioli with Shaved Fennel and Burnt Sage Butter – a dish so insanely good, just saying the name makes my mouth water! Born out of the need to feed a friend who is a borderline vegetarian (and a selfish desire to use a ravioli mould that I bought when last in Rome), this delightful little dish is damn near pasta-perfection on a plate. A variation of the Italian classic Ravioli di Zucca, the addition of the thinly shaved fennel is a refreshing twist, both in terms of texture and flavour. The crisp fennel and lemon cuts through the richness of the pumpkin/pasta parcels and burnt butter, giving the original dish much needed balance. This satisfying dish makes for an amazing starter, as it does a worthy main.